I've created a Google Search Widget for the Carnival of Space. It's experimental only in that it is subject to tinkering. The intent is to be able to search through sites and pages related to the Carnival of Space. Tinkering will be limited to the addition of related sites, and changes to options to limit how far the search can expand itself. Currently, the widget searches each page has hosted the Carnival and dynamically includes pages linked from these pages. The search should not expand beyond this to the larger Internet. I will also be adding individual sites from the carnival. I had tried some different options initially and found some the searches went a bit astray. I'll put this down to my inexperience with Google CSE widgets. I'll update this post if I make significant changes. I've also added it to the blog's side bar for when this rolls off into the archives. For more on Google Custom Search Engine widgets, see here. BTW. If you are considering using this widget or creating one of your own, Google's Terms and Conditions include some "Exclusivity" terms to preserve their lock-in. If I read it correctly, they don't want to share their widgets on pages with other search engines/widgets. Update: No longer experimental. The options that I'm using to limit searching too broadly have been working well and there appears to be no need to tinker with them anymore. 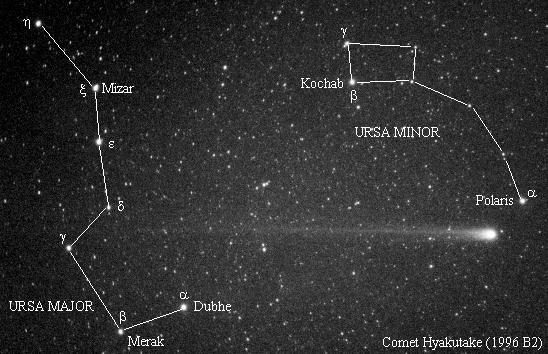 Showing how to use the pointer stars (Merak and Dubhe) of the Big Dipper to find the Polaris (the North Star - the comet in the photo shows the way). Using a star chart and finding 5 constellations, see Planispheres. Learning and relating star lore (classical or aboriginal), see the Wolf Moon for one example. Knowing and describing 3 (astronomical) features of the sky, such as comets, asteroids, planetary rings, strange quasi-moons, or other news. Knowing about the phases of the moon and tides, see the Tides Game. Earning an astronomer badge automatically counts for Black Star requirement A11 (finding the north star and 3 constellations). Requirement 1 is paramount as it can be used to find direction! I would be interested in hearing from Cubs outside of Canada about astronomy requirements in their badges and awards. In particular, I would love to hear from Scouters in the southern hemisphere. Update: Above I noted that Cubs can double dip on requirements for the Black Star. It turns out they can actually triple dip as the Winter Cubbing badge has a requirement to find the North Star and three night sjy objects! Update: If you are a Cub leader outside if Canada, please also read The Great Astronomers Badge Swap. And please click on the BadgeSwap label below to see other related badges and entries. The unusual 3753 Cruithne (our "2nd moon" and pronounced "krooy-nyuh"). See here or for a very neat animation here. An old Apollo 3rd stage was briefly thought to be our "3rd moon", here. Even more unusual object is 2002 AA29 which is our once and future "moon", here. And a quasi-satellite called 2003 YN107, here. I led you on a bit as these are actually called co-orbital bodies and quasi-satellites. They aren't actually true satellites like our moon. Some of these orbits are very weird! Crutithne is not actually pushed away from Earth. The annimations are usually in two dimensions and really cannot capture the complex interactions that happen in the four dimensions of space and time. There may also be other asteroids in stable solar orbits near earth at the five "Lagrangian Points". These are strange places in space where you can get gravity without actually having a large mass like a planet. These happen when you have two objects with a large (planet size) and really large (sun sized) mass interact. Rather than trying to think about the math, you could think of a standing wave in a river as an analogy. 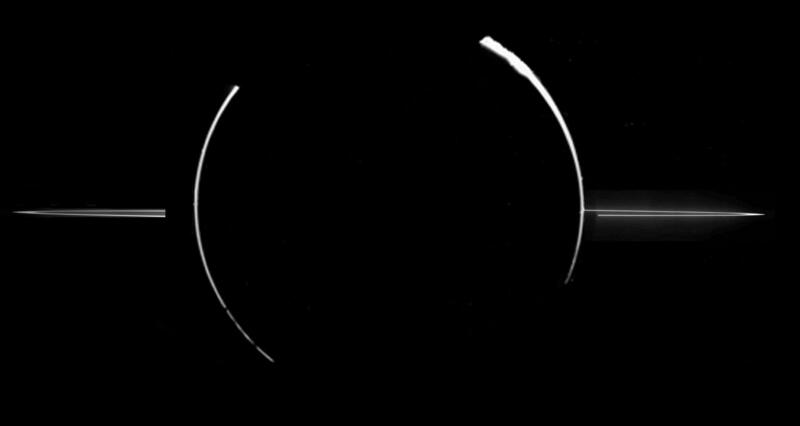 Update: There have been some historical beleif in and attempts to find moons around Earth. A summary can be found as part of this longish essay, here. This weeks meeting was supposed to be a tobogganing party at Akela's house. It just didn't work out that way. It almost turned into a wakeboarding party! I write this now watching the tail end of the 30+ cm of snow we were hit with Wednesday, thinking about last Friday's snow storm that closed schools in Toronto around mid-day and left most of us digging out. Enough snow to close Toronto schools is a rare event indeed. We had every right to expect a great tobogganing party. Unfortunately for our plans, we were hit with an all too frequent thaw and rainfall over the weekend. So by Tuesday night, the hill was fine thin but the 8 cm deep mini-lake of ice water at the bottom was definitely a bad thing. Making the best of it, we went on a hike through West Deane Park Valley, slid down hills, made snowmen and had snowball fights. When done, we retired to Akela's basement for cookies and hot-chocolate. Isn't it good to have a plan "B". Light pollution is the bane of Astronomers. Professional astronomers often use instruments that operate outside of the visible spectrum. That's how telescopes like the DDO (see here to help save it) can still be effective even when located near a city. Recent studies suggest there are also biological effects on people, animals, and plants. The ill-timed Earth Hour event will disappoint North Americans this year. However, you may remember the North Eastern Blackout of 2003. That evening, I took my dog for a walk at the usual time. I took along a flashlight just in case. In good scouting fashion I was both prepared and didn't need to use it. Most of the people I met walking their dogs at the same time did not expect it to be so dark so soon! I told several families that I met that I would have a telescope on my front lawn. Upon my return, I set up my 8" non-computerized reflector scope on the front lawn. A couple of the families stopped by to look. 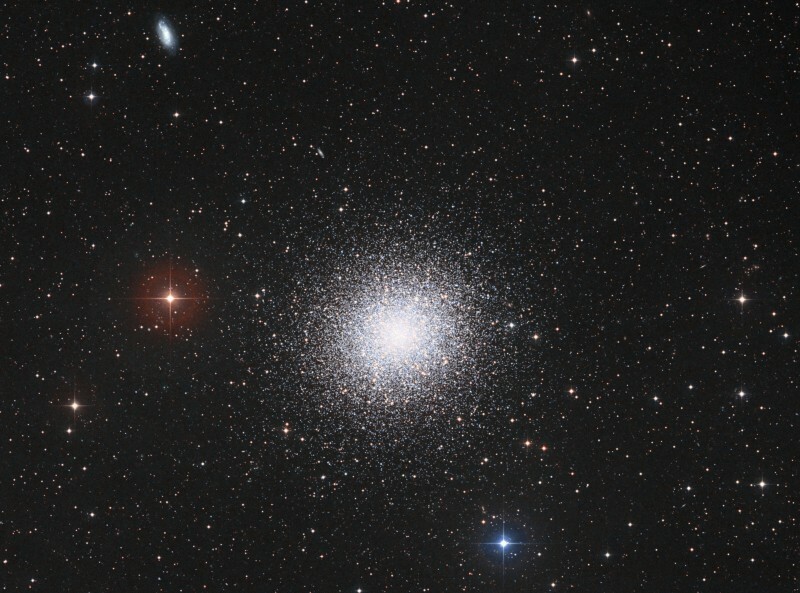 My first target, was the great globular cluster M-13 in Hercules. Without the city's interference, there was no effort searching for it. 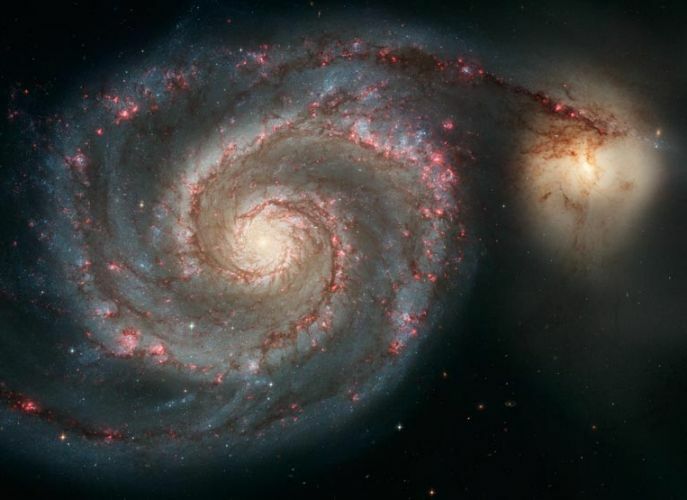 Next, I tried the Whirlpool Galaxy (M-51) beneath the handle of the big dipper in Canes Venatici (the hunting dogs). While I'd seen it before in larger scopes, this was a target that I'd never found myself. A few star hops and soon I found it near a small triangle of stars. While little more than small grey smudges in my scope, it was clearly visible. (Note: beautiful photos like the ones above require long exposure times as people don't actually see that well through telescopes). Unfortunately, around about 10pm the full moon came up and ruined the party. The next night with the lights back on, I returned. And even though I knew I was looking right at it, I couldn't see event a hint of the Whirlpool.